This is our most popular coffee and a personal favorite of James'. A very popular choice of cafe's and corporate customers. Excellent value with superb quality. A Guatemula based coffee bean. A strong coffee with refined acidity, subtle cocoa texture, gentle spice flavours and a sweet aftertaste. An award winning coffee bean blend. 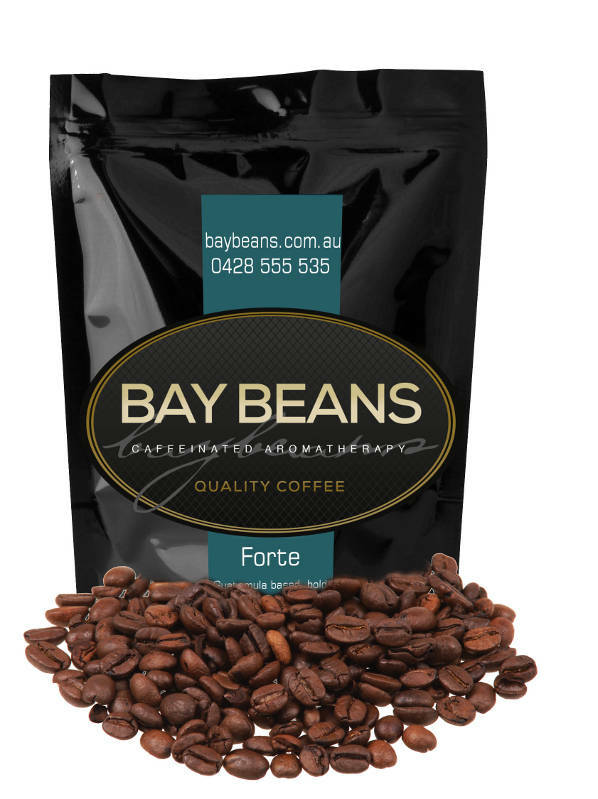 Bay Beans Forte' coffee beans are roasted fresh the day you place your order. Bay Beans coffee is packed in one-way valve, foil lined bags for ultimate freshness. Buy Forte' coffee beans. Customer Reviews - Forte coffee beans. I purchased my own cafe two weeks ago and changed the coffee to Bay Beans Forte. My customers love it and my coffee sales are increasing every day! Your customer service and fast delivery is also fantastic. Thank you! ​Each Bay Beans delivery is like Christmas. I even let the delivery guy smell the box so he can enjoy it too. So fresh, so tasty. Awesome online coffee experience. ​Just ordered my second kilo of beans from Bay Beans. Going to drink my way through their entire selection. Keep up the good work James and team! ​This is the coffee I have been looking for my whole life!!! After looking online and reading many reviews on different coffee's I bit the bullet and decided to buy a couple of different one's from various sources. Not only was the service from James at Bay Beans personal but also incredibly fast. I ordered the Forte blend and was absolutely thrilled with both the taste and texture of the coffee. Right from when I first opened the bag, I just knew I was going to be in for a treat. Thanks you so much James for finally giving me a coffee I can sit and enjoy that takes me away to a whole other place. I will definitely be a regular buyer after this and couldn't imagine being satisfied with any other coffee now. I am ruined (or spoilt) for life. I had my first experience buying coffee beans off you this week and I felt compelled to tell you how excited I am. First off, after ordering Saturday night and being from Toowoomba Queensland, I was expecting delivery maybe Wednesday or Thursday and was over the moon when I heard a knock at the door Tuesday! Secondly, I have always had problems with early blonding with my coffee shots and always put it down to either my grinder not being up to scratch (Sunbeam EM0480) or my technique being off (I have only been doing this a few months). So, I couldn't believe my eyes when I was watching my first coffee shot - Incredibly dark and streaky right up until 25 seconds, with the best looking crema i have ever seen.And lastly the flavour, holy hell, the best I've had so far. I have always gotten my beans from local cafes that supposedly freshly roast... So thank you very much, you have earned yourself a regular customer. Submit your own review of Bay Beans Forte coffee beans.